This would be just another day in the week for me but most places were closed today and the few friends I have were busy with family and friends. Sometimes an individual ends up as an outsider not by choice. I decided to spend the day profitably and bang out another edition of my print zine, Ray X X-Rayer, albeit a short one, one sheet - two pages. With that printed and out in the mail earlier in the afternoon, I'm using the quiet evening time to reformat the zine article and post them here. Usually I do the opposite: blog posts first, then reformat them for a zine. I don’t know how coherent my writing is today because I’m suffering from a one-two punch of allergies and a cold, sneezing and coughing. The cold started last night. How appropriate. Like I say, timing is all about the comedy. At least the sun was out today. My computer is near a window and the streaming light felt good while I was working on my zine, even though was around the freezing point outside. Better than the usual cold gray gloom that I see most days during the six months of winter around here. Even with the sun out I was shivering while walking over to the Post Office, despite being bundled up. I must have some sort of bug if my energy and resistance is that low. But at least I got out of this efficiency apartment / monastic cell for some fresh air. Now time to reformat and post my latest articles to follow this one. While listening to the Liberty Net (www.3950.net) recently I’ve heard the term “civil disobedience” mentioned. This was provoked by the re-election of President Obama, an event that produced consternation among the ultra-conservative ham radio operators. “I TUNED INTO THE CHAT TO FIND HOPE FOR US. THERE IS NONE! NOT A WORD OF WHAT WE CAN DO AT ALL AFTER Nov 6th!! Not HOPE but HOPELESS! All freedoms, any way out have been sealed before we could save our country from slavery and confiscation of ALL of our property! Nothing is sacred. Everything will be taken in the next fer months, not years!! Owhore is the most destructive human ever! “Owhore is taking the place of God and family! Nothing is more important or must be worshiped more than him! HE BRINGS TO US ALL THINGS! wE ARE BEING JUDGED BY IMPOSSIBLY LOW RATING OF TOLLERENCE, WE VIOLATE EVERY LAW OF ACCEPTANCE TO HIM. WE ARE ALWAYS WRONG ON ANY SUBJECT, SO WE MUST BE DESTROYED!! Being judged by this filthy sickening pervert is just rediculous! This fool judges others?? The good people are not acceptible to him!! He doesn't represent us at all! Because of this I wonder if there is a God!! Keep in mind that the LibNetters’ man was Ron Paul, not Mitt Romney. They would have grudgingly accepted a Republican like Romney: he was the lesser evil of two lessers. Should be interesting to see if the LibNetters do formulate some sort of plans for civil disobedience instead of bloviating as usual on air and online. 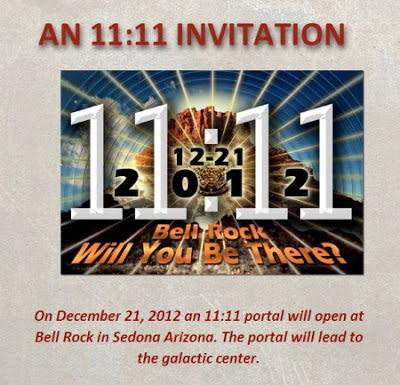 “UFO lawyer” Peter Gersten waited for an interdimensional portal to open above Bell Rock in Sedona, Arizona after the magical hour of the winter solstice arrived on December 21, 2012. With his Leap of Faith he said he was going to jump into the portal and save the world which he considers to be nothing more than a hologram. No portal, no Leap of Faith as advertised. Gersten just went home. Apparently the authorities were concerned about him and anyone else showing up for the cosmic event who might be considering taking a leap. Police and an emergency crew were nearby as seen in a news video posted online by the Fox 10 TV station in Phoenix*. The video also shows some of the characters who showed up, including a couple of aluminum foil aliens, i.e., people wrapped in foil suits with springy antennas topped with silver balls attached to their heads. For some of you the image of the cute cartoon flying saucer above looks familiar. I previously wrote about a movie serial from the 1950s based on the comic book character Blackhawk. The hero is in his plane when the bad guys attack with a remote-controlled flying saucer. The “Blackhawk” serial was made in 1952 with Kirk Alyn as “the fearless champion of justice.” Back in 1950 Alyn starred as the hero in a different serial based on Superman. I didn’t see “Atom Man vs. Superman” until recently and was surprised to spot a familiar cartoon flying saucer making its appearance, this time under the control of Supe’s arch enemy Lex Luthor. At one point newspaper reporter Clark Kent (Superman’s secret identity) and his co-worker Lois Lane are in the Daily Planet airplane when they encounter the animated weapon. Fortunately Lois faints so that Clark can change into Superman and save the day. The “Blackhawk” movie serial two years later did some recycling from this movie. It used the same airplane, the same lead actor, and the same cartoon saucer. 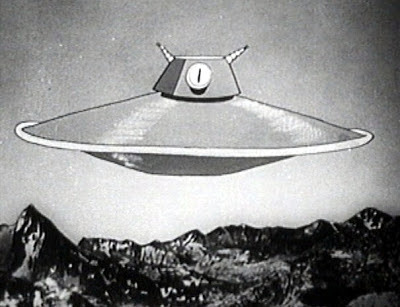 If you think the saucer looks bad in my screencap image, you should see how they did some of the flying shots in the Superman serials. Clark Kent would run behind a tree and then a cartoon Superman would fly up, up, and away. FADEAWAY – Robert Jennings, 29 Whiting Rd., Oxford, MA 01540-2035. Robert’s articles are well-written. Even though I’m not a fan of Tarzan or old time radio, I ended up reading an article about Edgar Rice Burroughs marketing his most famous character to radio back in the heyday of the medium. What hooked me was how ERB was trying to be a smart businessman, unlike most writers/artists. Subs are $18.00 for six issues. Copies are available for a print fanzine in trade or letters of comment (LOCs are preferred). OPUNTIA – Dale Speirs, PO Box 6830, Calgary, Alberta, Canada T2P 2E7. Digest size, 16 pages. $3.00 cash (US banknotes acceptable) for a sample copy, trade for zine, or letter of comment. If you want diversity, you can find it with zines. Dale’s background includes working for many years for the Calgary Parks Department. Opuntia #69.5 (Oct. 2010) has an article about a visit by Princess Margriet of the Netherlands told from his viewpoint as a park employee. An interesting slice of (park) life. Other issues deal with topics – with a Canadian slant – such as financial panics, the oil and gas business, and transportation. And if you’re really geeky, Dale has a feature called SEEN IN THE LITERATURE with excerpts and occasional commentary on such articles as “Pitchers of Nepenthes rajah collect faecal droppings from both diurnal and nocturnal small mammals and emit fruity odor” from the Journal of Tropical Ecology. Hey, if you work in a park, you gotta know your plants. It's a big hit even before it's on the air – or even before one episode has been produced. A slightly nebbish writer/documentary producer from England – Jon Ronson – teams up with a ranting right-wing radio commentator from Texas – Alex Jones – to investigate shadowy evil conspiracies around the world. High concept: "The Odd Couple" meets "The X-Files." My series is based upon Ronson's non-fiction book, "Them: Adventures with Extremists" (2002), detailing his travels about the US and Canada while looking into the world of conspiracy theories. 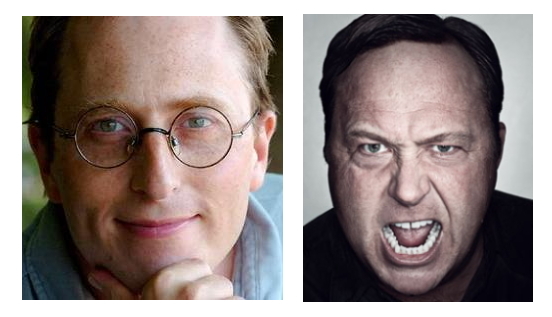 In the book Ronson encounters Alex Jones, anti-Illuminati crusader, and works with him to penetrate the secrets of Bohemian Grove. The Grove is a vast California campground where some of the most powerful men in the world meet mid-summer for two weeks to piss on redwoods and watch a ceremony called Cremation of Care where a human effigy (or live sacrifice, according to Jones) is burnt in front of a giant owl statue. To Jones the owl represents Moloch, an ancient god associated with child sacrifice. The ceremony represents the apex of evilness among the men who meet at Bohemian Grove each year, a Luciferian - Babylon mystery religious rite. To Ronson the whole Bohemian Grove experience is nothing more than a bunch of aging men acting like college kids once again, frat-boy nonsense. The dichotomy is obvious between Ronson – the rationalist – and Jones -- the ranter. In "Them" Ronson describes how he and Jones found a way to get into Bohemian Grove to witness the Cremation of Care. They were told from a contact who had already sneaked in to dress and act preppy and just walk up the road as if they belonged there. For dapper Ronson dressing and acting preppy was easy. Jones and his radio show producer had to practice, walking around in their new clothes from a nearby Eddie Bauer and practicing the manners and speech of Grovers. When the time came to take the walk into the Grove, Ronson and his contact just strolled by the guard. On the other hand, Jones and his producer couldn't handle such an easy entrance: they dived into the bushes and snuck in like kid commandos. Very dramatic. Makes interesting radio – or in this case, TV. Is this set-up a natural or what? MacGregor would be adequate for the TV series. Best casting would be a young Don-Knotts-type as Ronson. As for Jones, is the Incredible Hulk available? "Ronson & Jones" -- coming to an alternative TV network in an alternative universe near you. Peter Gersten: Still Planning His Apocalyptic Leap? "If I'm wrong, everybody dies." So proclaims a 70-year-old freethinker in an online video (ebaumsworld.com) entitled "Apocalypse 2012 Hero Peter Gersten" about his plan to save the world by leaping off a towering rock at the moment the winter solstice arrives. Human beings, he believes, are part of a computer program, a hologram. Peter Gersten is known as "the UFO lawyer" for his legal efforts to find out what the US government really knows about strange things in the sky. He has announced that he will leap from Bell Rock in Sedona, Arizona at 11:11 UT (Universal Time) or 4:11 AM local time on December 21st, 2012. As one article has noted, the winter solstice doesn't really occur until 11:12 UT. Hopefully Gersten won't jump the gun. Maybe he needs a minute head start to achieve his goal: participating in a T-DE, Trans-Dimensional Event, that will allow him to enter a cosmic portal. I wrote before about Gersten's Leap of Faith but I didn't know about the save the world angle. He states in the video that he's doing this for his children and grandchildren, all of the carbon-based life forms in this world. "...I believe that some type of cosmic portal will be opening at that time and place and that an opportunity will present itself. I fully expect that it will either lead to the next level of this cosmic program; freedom from an imprisoning time-loop; a magical Martian-like bubble; or something equally as exotic." Gersten says the we're all trapped in a computer program that is scheduled to shut down. Unfortunately I haven't found any further details on how his leap will stop the Apocalypse except it somehow undoes the prophecies of doom. Maybe his leap will reset the cosmic computer? Another video I found on YouTube -- "Peter Gersten Bell Rock Leap of Faith," -- provides a possible answer to how his leap will save the world. At one point it seems that Gersten, responding to a question, mentions something about a corrupting virus in the computer program. There's a lot of wind noise that drowns out most of his reply but I'm guessing the Leap of Faith will transform him into an anti-virus. In this second video Gersten also mentions that the jump is 20 months away and that his family and friends aren't taking him that seriously. Gersten explains he is going to go "be in the moment," seeing what happens at the magic time. The universe, he continues, will fill in the details. Asked what he will do if the portal doesn't appear, he replied someone on this side might be needed to open it and so he will have to do it himself by jumping. There's a disturbing moment in the video when Gersten responds to a question, saying that December 21st, 2012 should be a good day to die. A video crew member corrects him, telling him to use the term transition, not die. Gersten sorta shrugs his shoulders, saying transition or death, it's just a question of semantics. "Most of you will think that I am delusional and that my insane act will certainly result in my death. Death is inevitable – at least nowadays – and 100 years from now it won’t matter whether I died in 2012 or 2013 or even 2020." I can only speculate on what he really going on inside Peter Gersten's head. Maybe he's having some doubt with his belief in the cosmic portal. Doubt does strike at times with people of faith. A cynic would say this is a way of getting attention, making one's life have more meaning. I'm guessing that as the time draws near Gersten's friends and family are trying to talk him out of his leap. No news -- at least any I can find online -- whether or not he has changed his mind. Besides 3950.net another site, stickam.com/ thelibertynet, also streams the Liberty Net on-air discussions with a chat room. This image is from the second site. LibNetters claim that they are against Barack Obama but not because he is black. Then why do some of them use terms like "monkey" when referring to him? And the sisyphean Liberty Net keeps trying to roll their rock up Reality Hill, each time expecting a different result. 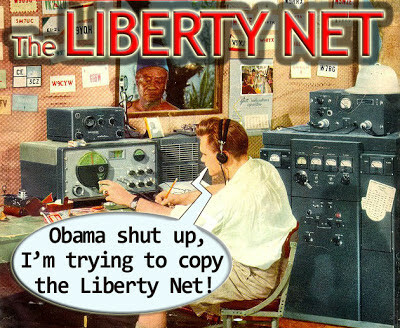 Every Saturday night the Lib Netters take to the airwaves, ham radio operators of the ultra-conservative bent (think mega-conspiracies: Illuminati, New World Order, etc.). Simultaneously they also share their views via text in a chat room at 3950.net . Sometimes I copy and archive the chats. I found one session from three months ago to be particularly interesting. One person who joins the LN airwave discussions is Vern Kasper, an older man who is has been successful in business, owning a number of commercial radio stations. Vern has also traveled around the world a bit and offers a cosmopolitan view on current events. I wrote about Vern one time at this blog, noting how some people in the Lib Net chat room -- not all -- said some unpleasant things about him one night. Comments like "I, I , I , I, I, I, Vern is the EYE man," "over half an hour of the marvelous Vern," and "Glad I can be here to be listening to the VERN net." You can read all the comments at that previous post. I didn't invent the comments; I just copied and pasted them. On September 9th, 2012 Vern made another appearance on the Liberty Net. Once again he went on for a while about his radio stations, his travels around the world, repeating some of the same points he has made before. (Then again, most LibNetters keep repeating the same points every week.) Of course, a few in the chat room had to make disparaging observations. Like this one: "And now, broadcasting from his new Cadillac, high atop the parking garage of VER"
One LibNet chatter known as JD was looking for a photo of Vern online and came across my blog post. He shared the link with the other chatters. The following chat room excerpts show what kind of reaction my blog post provoked. "RickFlint: JD That is amazing! What a dink Ray X (or Ray Jay...) is!" "RickFlint: THin [sic] skin Ray doesn't know sh*t! We love Vern. No disrespect other than some joking around due the the [sic] boredome [sic] time. It's like waiting in a check-out lin [sic] forever at the grocery store, an [sic] eventually buy a damn candy bar!" "RickFlint: For Ray Jay to knock us for simple comments show his own simplicity. FOR THE RECORD, WE LIKE VERN, THINK HE IS SMART AND CELEBRATE HIS AGE!" "JD: I agree with you. I have no idea who the Ray guy is, never heard of him. Vern is all right by me!" "RickFlint: I don't think the 'Vern Show' is disrespectful or any other thing. Remember two weeks ago when Al couldn't get back to his comments when Vern just popped in and overwhelmed the net for a half hour! Al was really ticked off but we chatters just busted a gut laughing! What else could be more entertaining than that? Lemonaid [sic] from lemons... God bless Vern and Ray, buzz off!" I'm thin-skinned? I think the ones with the diaphanous epidermis are the LibNetters who don't like it when someone follows their conversations, makes notes, and then just shares what he observed. It's hard to argue when it's in plain black and white text. Anyway, you think conspiracy theorists would never assume no one outside their inner circle with a contrary POV is lurking.